Everyone will have a different approach to keeping a self-sufficient homestead, and it’s unlikely that any two 1-acre farms will follow the same plan or methods or agree completely on how to homestead. Some people like cows; other people are afraid of them. Some people like goats; other people cannot keep them out of the garden. Some people will not slaughter animals and have to sell their surplus stock off to people who will kill them; others will not sell surplus stock off at all because they know that the animals will be killed; and still others will slaughter their own animals to provide their family with healthy meat. Milking a cow doesn’t take very long — perhaps eight minutes — and it’s very pleasant if you know how to do it and if she is a quiet, docile cow — but you will have to do it. Buying a dairy cow is a very important step, and you shouldn’t do it unless you do not intend to go away very much, or unless you can make arrangements for somebody else to take over your milking duties while you’re gone. So let’s plan our 1-acre farm on the assumption that we are going to keep a dairy cow. 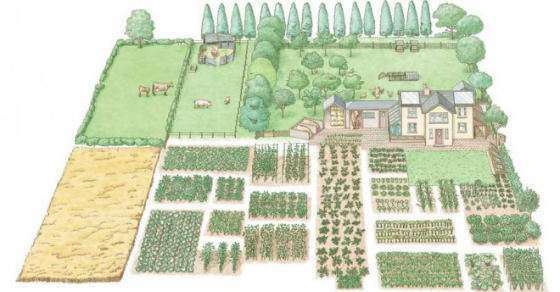 The remaining half of your homestead — the arable half — would be farmed as a highly intensive garden. It would be divided, ideally, into four plots, around which all the annual crops that you want to grow follow each other in a strict crop rotation. 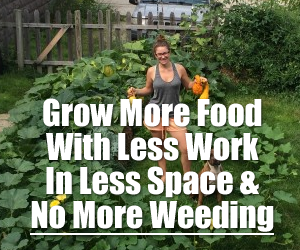 Consider the advantages of this kind of crop rotation. A quarter of your arable land will be a newly plowed-up, 4-year-old field every year, with intensely fertile soil because of the stored-up fertility of all the grass, clover and herbs that have just been plowed-in to rot with four summers’ worth of cow manure. Because your cow will be in-wintered, on bought-in hay, and treading and dunging on bought-in straw, you will have an enormous quantity of marvelous muck and cow manure to put on your arable land. All of the crop residues that you cannot consume will help feed the cow, pigs or poultry, and I would be surprised if, after following this crop rotation and grazing management plan for a few years, you didn’t find that your acre of land had increased enormously in soil fertility, and that it was producing more food for humans than many a 10-acre farm run on ordinary commercial lines. A dairy cow will not be able to stay outdoors all year. She would horribly overgraze such a small acreage. She should spend most of the winter indoors, only being turned out during the daytime in dry weather to get a little exercise and fresh air. Cows do not really benefit from being out in winter weather. Your cow would be, for the most part, better if kept inside where she would make lovely manure while feeding on the crops you grew for her in the garden. In the summer you would let her out, night and day, for as long as you find the pasture is not being overgrazed. You would probably find that your cow did not need hay at all during the summer, but she would be entirely dependent on it throughout the winter, and you could plan on having to buy her at least a ton. If you wanted to rear her yearly calf until he reached some value, you would likely need a further half-ton of hay. I have kept my cow on deep litter: The layer of straw gets turned into good manure, and I add more clean straw every day. I have milked a cow this way for years, and the perfect milk made good butter and cheese, and stored well. Although more labor-intensive, you could keep your cow on a concrete floor instead (insulated if possible), and giver her a good bed of straw every day. You would remove the soiled straw daily, and carefully pile it into a muck heap that would be your fount of fertility for everything on your acre.